I don’t often blog about items of a more personal nature, but today is an exception. Over the past several months, I’ve had the pleasure of taking some time off of work to spend with my family. In February, our third child, Brian, came into the world, joining his sisters Veronica (age 3) and Alice (age 1). This recent time spent with my family was unquestionably some of the best time of my life. It wasn’t just my job which I took time off from, however. With three children 3 and under, I found myself pretty busy, helping my wife Sarah doing whatever needed to be done. As a result, I also took some steps back from many of the activities which I’ve been involved with in my community. I had also neglected my blog as well. With my break now over, I’ve returned to work, and have started to re-engage with colleagues in my office, and with my friends throughout the community. I’ve been giving a lot of thought to how I can best manage my own personal scarce resources – the biggest being time – trying to balance the needs of my family with my community interests. I’m still not quite sure how successful I’m going to be, but one thing has become apparent to me over the past few months: I must do more for my community. And I need to do a better job than I’ve done. This may seem like an unusual way of trying to balance family life with personal interests. But really, what’s motivating me are those very same three children who are there to greet me when I come home from work. For instance, I can’t help but think about my oldest daughter, Veronica, who being born in 2010, may live to see the turn of the next century. Almost certainly my grandchildren, should there be any, will be alive during the first part of the 2100’s. I can’t help but think of what kind of community, and what kind of world, my children and grandchildren might inherit. That’s why I need to do my part – and do it better than I’ve been doing. I have great faith that the world is going to start to change for the better at some point. My sincere worry, though, is that the change will arrive on its own terms, and not those of humanity’s choosing. I firmly believe, though, that the growing gap between the rich and the rest of us will start to reverse over the next 90 years, and that fossil fuel energy sources will begin the lengthy process of being phased out, maybe even starting within the next two decades. If we are to have any sort of bright future, at the very least we must begin tackling the issues of the inequality of wealth and the climate crisis. That being said, I fear that our current hyper-capitalist system is about to smash into a hard wall of economic reality – that perpetual growth which our system relies on can’t be sustained. Already we are seeing the system strain under its own weight, with austerity having become the current “fix” to provoke growth. In a world where resource inputs are only getting more expensive over time, it only makes sense to look for other areas of savings to offset higher input prices. Growth, after all, is the end goal of our hyper-capitalist system. To facilitate growth in the face of increasing resource inputs, it is essential to lower corporate taxes, and to lower employee wages and benefit premiums. That’s what the austerity agenda is about. The theory is that this agenda leads to growth (which it may in the short term, but even that’s a question mark). In practice, we’ve seen how it has played out (and will continue to play out): with significant impoverishment for the majority of humanity and the continued concentration of wealth in the hands of a tiny minority. The austerity agenda simply isn’t sustainable over the long term. I believe that it will prove itself to be unsustainable over the next two decades. The damage that it will inflict on humanity and development within that timeframe, however, will be colossal. Only when decision-makers can no longer tolerate the implementation of the agenda will moves be made to counteract the hyper-capitalist austerity agenda. These moves will take the form of significant reforms to the global economy. The “getting there”, though, is likely to be horrible. Perhaps even bloody. It’s not likely that decision-makers will wake up one morning and say to themselves, “Wow, we’ve been doing it all wrong for the past 30 years. We’ve got to change for the sake of the future of humanity.” More likely will be scenarios where the original decision makers are themselves replaced by new decision makers, by a ballot box process or otherwise. But the hyper-capitalist players behind our current crop of decision makers will do what they can to keep those current decision makers in power for as long as possible. Of course I favour a ballot box process as the instigator for reform, but I’m not naïve enough to think that it’s going to happen that way throughout the world. What I can’t do is influence to any significant degree events which may or may not happen in places like China, Africa or South America. What I can do is to try to help out in my own little corner of the world. To help lay the groundwork for the coming transition to a low-carbon marketplace economy, and to assist with the coming transition. For change is inevitable. What I would like, for me, my family and community, is change on our own terms. Not to have change thrust upon us from outside sources (especially not in the form of war, famine or disaster). Better, I think, to plan for the low-carbon future, and to bring about an economic system which is truly sustainable. Look, I’m not talking here about a revolution. More of a reformation, really. The current culprit in our economic system isn’t capitalism itself – it’s the immoral way in which capitalism is being practiced. It is possible, I think, to have a capitalist economy which does not have greed at its heart. Instead of the pursuit of personal wealth, a marketplace capitalist system which emphasizes community development, social justice and sustainability could arise from our current hyper-capitalist system. And I think it will, because the alternatives are simply too grim to contemplate: a world of polarized inequality and servitude, where the rich literally own the poor, and democracy has become an endangered species. I don’t think we as a global society could tolerate such a world, even though that appears to be the very path we are currently on today. I believe, though, that the forces of globalization will almost assuredly prevent this dark world from arising. I have faith that the masses of humanity are already hard at work to build the brighter future that I believe in. Writing about “faith”, “belief”, “morality” and my expectations for the future has really taken me out of my comfort zone today. Nevertheless, I think it’s important for my readers to have a better idea of where I’m coming from. You see, with all of this in mind, I’ve come to the conclusion that if I really want to start laying the groundwork in my community for the arrival of a brighter future, there are certain things that I’m going to have to do. And they all have to do with this notion of decision making. I firmly believe that if one doesn’t like the decisions being made by decision makers, it may be that the decision makers can be influenced in such a way as to make different decisions. This approach can take time and effort, but sometimes it’s the best approach to take. It’s also easiest to undertake at more local levels. As an example, look to the conversion of Mississauga Mayor Hazel McCallion, from urban sprawl advocate to opponent over her years in office. In my own City, I’ve seen the (often maddeningly slow) shift in the attitudes and decisions of local municipal councillors. Issues which weren’t being talked about in my community, such as enhancing water quality and promoting active transportation, are now routinely discussed during council and committee meetings. Of course, there has been a public backlash of sorts, albeit one which I think is limited to certain right-wing elements in my community. The pace of change may be too slow for my liking, but I can’t deny that progressive change has started to happen in Greater Sudbury. However, the same can’t be said for the provincial and national levels of government. And I think this has a lot to do with Party politics. In a party-based political system, often doing what’s in the Party’s interest takes precedence over doing what’s right. Parties, for a number of reasons, have to continually play to their base, or risk losing valuable support and power. Since a Party’s base is always going to be fairly resistant to change (barring some catastrophe), the Party system tends to thwart innovation and trump the implementation of good public policy. In such a political system, the power of influence is minimized (except when it is in the hands of a small few who control the Party’s purse strings). When the public seriously starts to demand change, it is often much easier to choose a new political party than it is to play the longer game of trying to influence the one in power. Of course, with our archaic electoral system in place, the will of voters demanding change can easily be (and frequently is) distorted at the ballot box. Although I am not an admirer of the Party-based political system as it exists today in Canada, since I crave change, I find that I must do what I can within the existing system to promote change. That’s why I chose a number of years ago to become a member of the Green Party of Canada, because I believed then as I do now that the Green Party comes closest to sharing my values, and to sharing a vision for that bright and sustainable future which I believe will come about. Having taken a long and hard look at the other 3 old line national political parties, I continue to see how they will fail to champion the transition to a low-carbon economy, and in the specific case of the Conservative Party and the Liberal Party, how they will continue to offer significant resistance to the transition through their support of a hyper-capitalist austerity agenda. I’m certain that I’ve offered more comprehensive views regarding my opinions of the other parties elsewhere on my blogsite, and I’m pretty sure that I will restate them again before too long, so I won’t go into any further detail here regarding how I’ve arrived at these conclusions. But there is one thing that I would like to say, in part to address some of the questions which have been raised by members of my community over the past year or so, and that has to do with why I tend to be so very hard on the NDP. First, I have to recognize that my criticisms of the NDP have become more prevalent over the years, so I agree with my detractors that it seems that I have become more anti-NDP. But the truth is actually otherwise. I think that my personal axe-grinding with the NDP has more to do with my belief that the NDP should be an ally in the way forward towards a low carbon economy. But the reality of the NDP continues to be quite different, as the NDP seems to want to pursue power for its own sake, and not simply to build a better future. To implement this power-seizing agenda, the NDP has become what it purports to hate – an anti-democratic movement which uses all of the tools of partisan politics to further its own cause. That the NDP, if it were ever to obtain power, might do some good for Canada, I have no doubt. But the NDP has no vision for the future, other than perhaps a modified status quo; the NDP does not appear to understand the coming changes and the need to plan for them. So if I am hard on the NDP, it is because I have expected more from that Party, and have continually been let down by them. But I continue to hope that the NDP might yet change. I have no such hopes for the Conservative Party or the Liberal Party. Which is not to say that I have no hopes for conservatives and liberals. In fact, I believe that the transition to a bright, sustainable marketplace economy in preference to a hyper-capitalist austerity agenda will benefit liberals and conservatives both. In fact, I know that there are many out there with a conservative bent who are already laying the groundwork for a low carbon future through their personal declarations of war on waste in any form. And I know that liberals are talking about market-based approaches to slow the growing wealth inequality gap. That neither the Conservative or Liberal Party seems particularly concerned with taking action on the climate crisis or market reform is testament to how out of touch those political parties have become with their supporters. And it’s also testament to the idea that leader-driven popularity contests which we call election campaigns are no place for the discussion of serious issues, as one former Prime Minister has suggested. When Kim Campbell made her observation, though, she was talking about that particular time between when the write was dropped and when voting ceased. Today, however, political parties are in permanent campaign mode – which makes every day an inopportune time to discuss real issues, as you may have noticed. The Green Party, too, has its flaws – I’ll readily admit that. Again, it’s not easy for someone who is opposed to the entire notion of Party politics to belong to a political party. But as far as political parties go, the Green Party isn’t much of one, in my opinion – but in a good way. It’s because I continue to see the international Green Party movement as being a force for change globally, and the Green Party of Canada continuing to influence events in my country, that I have decided that I need to devote greater efforts to my Party. In Northern Ontario, the Green Party historically hasn’t experienced much success (albeit we’re on par with the Green Party’s record throughout most of the nation, so I don’t view the past as a unique problem going forward). In Greater Sudbury, we have been lucky to have a few dedicated Greens around over the past five or six years to keep the Party afloat, and to provide the party with some exposure between elections. The community definitely knows that we’re here, especially in the Sudbury riding, where our Electoral District Association is healthy and growing in vibrancy. Since 2007, when I joined the Green Party, I’ve seen a number of great candidates stand for election federally and provincially. Fred Twilley, a good friend of mine, carried our banner in the last federal election in 2011. Later that year, Pat Rogerson emerged as a force during the provincial election, surprising the media and stunning her political opponents. And now, Greens have nominated Laurentian University student Casey Lalonde to run for the party when the next provincial election is called. Lalonde, founder of the Young Greens Association at Laurentian, is a deep thinker and fearless speaker, as well as a sincere democrat who believes more in getting people out to vote – for anyone – rather than to simply vote for her. It’s been a bit of a different story in Nickel Belt, where Greens have tended to form a more loose association, generally ralling around the Party’s candidate at election time. And we’ve had some great candidates in Nickel Belt. In 2011, Christine Guillot-Proulx led the charge federally, taking over from Fred Twilley. Guillot-Proulx was able to get voters starting to think about what a vote for the Green Party might mean. Stephanie-Lyn Russell carried the banner for the provincial Greens, following up on Guillot-Proulx’s successes. Clearly, the Green Party has been asserting itself in this corner of Northern Ontario for some time now. But much more work needs to be done. It’s no secret that despite the quality and caliber of our candidates, the other three parties perform much better than the Green Party does in Sudbury and Nickel Belt. Largely, this has to do with the historic health and vibrancy of their political machines, which consist of dozens of financial supporters and volunteers, which may swell into the hundreds at election time. But make no mistake, the campaigns of the three old line parties are not completely financed with local money, nor are they always led by local people. Sudbury in particular has been an “in play” riding for all three of the old line parties over the last few elections, and will be again in the next election. We can expect all 3 old line national political organizations to once again pour their money and volunteer resources into an attempt to capture this riding. We can expect all 3 parties to spend close to the maximum of their spending limits. In the past, we Greens have run modest campaigns, largely financed by a small number of local donors, and assisted by a few dozen grassroots volunteers. In fact, in the past two federal elections, we actually raised more money during the campaign than was spent, largely because candidates wisely adhered to a realistic election budget. Our candidates finished in fourth place, behind all three of the old line parties, but we have never measured our own success based on where we finished. The fact is that our Party has continued to gather momentum in Sudbury and Nickel Belt, and will continue to seriously challenge political opponents in these ridings in the future. That’s not just me talking out of my hat, by the way. Again, it’s something that I seriously believe in. 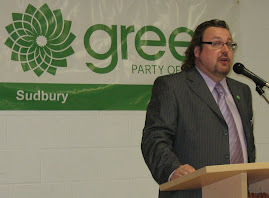 Even if we Greens do nothing locally to promote our Party or prepare for the next election, I have faith that the values on which our parties are based, along with the charisma of our federal leader, Elizabeth May, and provincial leader, Mike Schreiner, will move the party forward here in Sudbury and Nickel Belt. However, prudence suggests that if you want to get elected – I mean really want to get elected – there are certain things that have to be done in advance of an election campaign. And they all have to do with organizing and raising money. Sure, you might end up getting elected without either of those things (or even without campaigning, as several New Democrat MP’s from Quebec found out in 2011), but it probably won’t. So although we local Greens have been doing good things here in Sudbury and in the Nickel Belt between elections, I think it’s time that we start doing more. Elsewhere in Canada, Greens are getting elected (MLA Andrew Weaver in B.C.) and have fought strong campaigns (Donald Galloway in Victoria; Christ Turner in Calgary Centre), coming within a hair of winning. In Guelph, Green Party of Ontario Leader Mike Schreiner has been actively laying the groundwork for a successful campaign, and getting involved in significant community issues. And just this past week, Deputy Leader of the Green Party of Canada, and former NHL star Georges Laraque made the entry into the soon-to-be-called by-election in the Bourassa riding in north Montreal. Now, it’s true that all of the campaigns I listed above were waged (and will be waged) differently than any local campaign in Sudbury or the Nickel Belt during a general election. Simply put, it’s more than likely that we here in Northeastern Ontario will be on our own in the next election, and can expect only modest assistance from national and provincial parties in the election after that. But that alone should not be a deterrence to running a healthy and vibrant campaign, especially for an organization which prides itself on being grassroots. What we need is greater organization, money, time and attention. The good news is that with some hard work, not only can we possibly enjoy greater successes, leading to real and necessary change – but we can have some fun while we’re doing it. Although I’m not a particular fan of the Party-based political system, there are some aspects of it which I quite enjoy. The feelings of camaraderie and community which a Party can build and instill (not to mention the opportunities for participating in heated policy debates) are great ways to meet new people who are probably passionate about some of the same things you’re passionate about. And since I am passionate about leaving behind a suitable planet on which my children and grandchildren can prosper, I can and will do more to facilitate change and help shape the transition to a low carbon marketplace economy in the best way that I know how: through political change. To that end, if you live in the Sudbury, Nickel Belt or Algoma-Manitoulin-Kapuskasing ridings, and you’re on my list, you might very well be hearing from me again in the near future. I resolve to be fearless and thick-skinned, and I will ask of you. If you share my vision of the future, I sincerely hope that you’ll join me on the path to a brighter, more sustainable future for Northeastern Ontario, for Canada, and for our planet.